Page Street Publishing, 9781624145384, 192pp. 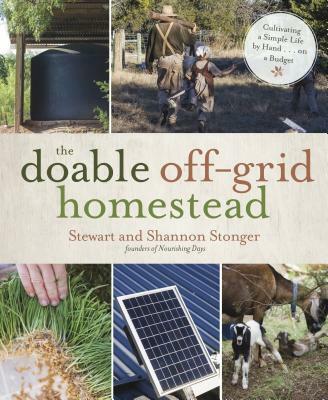 If you’ve ever thought about creating your own family homestead but weren’t sure how to get started or if it were even possible, Stewart and Shannon Stonger have been there and can help guide your way. They left their home in the city and moved to an empty plot of land with hopes of building a more sustainable way of life. Their years of research, limited budget, creativity and pursuit of their dream produced effective solutions that have taken them step by step to an independent, debt-free and off-grid homestead. In this book, they share how they did it to help others take the first steps in achieving their simple life dreams. You’ll learn how to build inexpensive infrastructure, harness energy from the sun, manage an off-grid home, grow vegetables in tough conditions, preserve the harvest, build an earthbag root cellar, raise beginner’s livestock and so much more. These attainable, game-changing tips and projects have allowed Stewart and Shannon to live a simpler, more rewarding life with their children. If they can do it, so can you! Stewart and Shannon Stonger are the founders of the blog Nourishing Days. Shannon is the author of Traditionally Fermented Foods and homeschools their five children, while Stewart works in web design and day labor in between building their off-grid homestead. The Stongers live with their children and an ever-growing number of barnyard animals on a five-acre off-grid homestead in central Texas.